Thank you to all the attendees of the 2018 Alaska Wind-Diesel Workshop who made this year’s event a success. 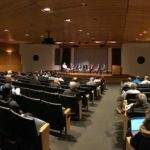 Also a special thank you to our moderators and panelists, to the Anchorage Museum for hosting and to the Alaska Energy Authority (AEA) and Renewable Energy Alaska Project (REAP) for organizing. Below you will find this year’s agenda and the presentations from each of our panels. Wind power generates more than 6% of all electricity in the United States, and is the nation’s second largest renewable source of electricity, just behind hydropower. This moderated discussion will look at trends in the nation’s and Alaska’s large wind market including technology, policy, and operation. Energy storage is helping to increase penetration levels of wind in Alaska. This moderated discussion will look at the latest technology advances and the use of energy storage technologies in Alaska. This session will cover the basics of Wind-Diesel hybrid power systems, giving attendees an overview of renewable energy, wind power and wind-diesel project development as well as providing a hands-on introduction to meteorological (met) towers and data loggers. Building, maintaining, operating and optimizing hybrid electric grids in remote communities with limited workforces and harsh operating conditions brings many challenges. Panelists will discuss how they are addressing a variety of issues to better capitalize on their local wind energy resources. There are unique challenges to financing projects in remote communities This moderated discussion will look at financing barriers, and strategies to decrease the risk of projects to lower financing costs, including the role of Alaska’s Power Cost Equalization (PCE) program.